When you think of olive oil, it’s normally as a part of a healthy diet, not necessarily as a beauty product. But did you know that olive oil has actually been used as a moisturizer and a way to rejuvenate damaged skin for thousands of years? Olive oil is actually a natural inhibitor that helps reduce the damage done to skin cells through sun exposure and aging, it has super hydrating and anti-aging properties. EVOO is the polyphenols that are one of the secrets to the many benefits olive oil provides. It is the high levels of polyphenols in Extra Virgin Olive Oil, functioning as both antioxidants and anti-inflammatories, that have help protect against sun damaged skin, increase the moisture retention capacity of our skin, slows down the deterioration of our skin in the form of wrinkles and discoloration, and so much more. Affordable and efficient, olive oil is great on skin because It is the large amounts of vitamins A, D, K, and E that are the key source of protein that helps fight the deterioration of the skin. The result leads to a more fresh and youthful appearance, dewy skin and silky hair. Use olive oil for your daily beauty regimen and experience both its immediate and long term benefits. Olive oil is used as an ingredient in many cosmetics. Olive oil soap has been made since the 6th century and is popular as a treatment for dry skin. It is commonly used in face creams, body lotions, shaving creams and shower gels. While it is used in cosmetic products, many people apply it directly to the skin. Extra virgin olive oil can be used to make many homemade cosmetics. You can add it to bath water, use it as shaving oil, mix it with sugar or salt to make an exfoliating scrub or just rub it directly on your skin, nails and cuticles as a moisturizer. 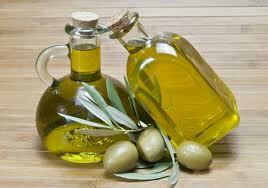 Moisturizer: Extra virgin olive oil is an effective treatment for dry or itchy skin. It is best to apply the oil right after you have cleaned your skin, and is most effective when your skin is still damp. Moisten your face with water and simply rub olive oil onto a clean face in a circular motion. Leave on overnight. Rinse face in the morning. Moisturize your hair: Apply Extra Virgin olive oil in your hair before you go to bed. Place shower cap over hair. Leave over night. Shampoo and rinse the next day. You may have to rinse and repeat multiple times. Your hair may appear limp or oily for a day or two. However, in the long run, hair will appear softer, shiny, and stronger than before. Moisturize your body: Before going to bed, rub olive oil all over your body in a circular motion. Moisturize feet and hands: For extra-dry feet or hands, Soften hands and feet overnight, apply extra virgin olive oil on clean hands and feet with gently massage. Sleep overnight. Rinse in the morning. Skin on feet and hands should be softer, especially after regular use. Lip Balm: It is effective as a natural lip balm for dry, chapped lips. Rub some olive oil on your lips to alleviate or prevent chapped lips. Anti-aging: The antioxidants contained in olive oil, such as vitamins A, C and E, can protect the skin against sun damage and the effects of aging. Massage olive oil into your fine lines and wrinkles, concentrating on any dry spots. This will moisten the area and help improve overall appearance. Exfoliation: Add a bit of olive oil to your daily bath to moisturize your entire body plus to remove dead skin and enrich healthy layers below. Moisten your face with water and massage olive oil directly into your face. In the palm of your hand, put a small amount of sugar. Gently scrub the sugar into the olive oil that is on your face. Rinse until all the sugar granules are gone. This will slough off dead, dry skin cells and leave your body with a natural, healthful glow. Please be sure that you are doing gentle massage using small granules of sugar because face skin is very sensitive so harsh massage or big granules will hurt the skin cells. In a bowl, add extra virgin olive oil, few drops of lemon juice and sugar or salt, mix them together and be sure that the quantity of olive oil is a little more than the sugar or salt, apply the mixture on your body, gently scrub the body, rinse until all the sugar or salt granules are gone. This will remove the dead cells and give a velvet shiny skin. Dried Nails: Give your nails a natural shine while simultaneously moisturizing your cuticles with olive oil. Simply rub a few drops into the cuticle area and dry nails will be a thing of the past. Soak your nails in olive oil to prevent them from becoming brittle. Eye Makeup Remover: For a simple, effective and natural eye makeup remover. Remove contact lenses before putting oil around your eyes. Dab your eyes with a cotton ball or cosmetic pad with EVOO to take off eye makeup. It will easily remove waterproof mascara. While effectively removing makeup without any irritation, it also helps to smooth out wrinkles around the eyes. Bath Oil: Adding 3 to 4 tbsp. of oil to your bath.